An elephant beetle, one of over a hundred species of insects on display at the Academy of Natural Sciences’ 10th annual Bugfest. Behind the children's area at the Academy of Natural Sciences of Drexel University, three employees in matching turquoise polos huddle together, exchanging wary looks. This narrow channel of a space temporarily serves as the "tarantula room" –– stacks of foot-long terrariums run the length of the walls, each housing a fist-size spider with a name tag (there are a Dante, a Charlotte, and a Tara, among others). But the scientists' concern at this particular moment is directed at an elephant beetle, a massive four-inch specimen with wiry black horns and a coat of silky grey fur. One of the scientists holds the bug between a thumb and forefinger; its legs are twitching slightly. "He's still moving, but I don't think anything's going on. He's gone," one of the onlookers says. With a grimace, the bug-holder slips the corpse into a plastic zip-lock bag and sticks it in the freezer. The scientist who called time of death is Karen Verderame, an entomology curator at the academy who loves bugs enough to keep multiple cockroach colonies in her house on purpose ("They're misunderstood creatures," she says). Verderame is one of the main organizers of this year's BugFest, the academy's 10th annual celebration of insects, where visitors can go behind the scenes at the museum to learn about, play with, and even eat bugs from the collection. The elephant beetle in question obviously won't make it to the festivities. "It was an adult," Verderame explains. "They only live about four or five months as an adult, and we've had this guy about four months." All dead bugs have to remain frozen for a while after their deaths. Eventually, Verderame says, students will be able to see this particular beetle up close; after they are frozen, dead specimens are mounted and absorbed into the museum's educational collection for kids to examine. But several of the beetle's brethren will be at the festival, along with more than 100 species on display. Buffalo beetles like these two will be on display at BugFest. Outside of Verderame's earnest affection for insects (particularly the elephant beetle, her favorite bug), the academy entomologist says she organizes BugFest as a kind of intervention –– to combat Americans' unwarranted fear of arthropods. "I think, like any prejudice, it's something we're taught," Verderame says. "If you've grown up seeing a parent or people in your life going eeeeursghg at insects, you catch on. It's something that's passed on." The knee-jerk reaction to seeing a spider or a roach, Verderame says, probably boils down to a fear of the unknown. "There's so many bugs out there," Verderame explains. "A beetle might land on you, and you've probably never seen it before. That's what's scary." BugFest offers visitors the chance to get more familiar with the bugs around them and help identify why they find them frightening. "A lot of people are grossed out by cockroaches, for example, because of the way they move," Verderame says. "At BugFest, we can explain why cockroaches crawl the way they do. After, you might not see it as creepy so much as utilitarian." 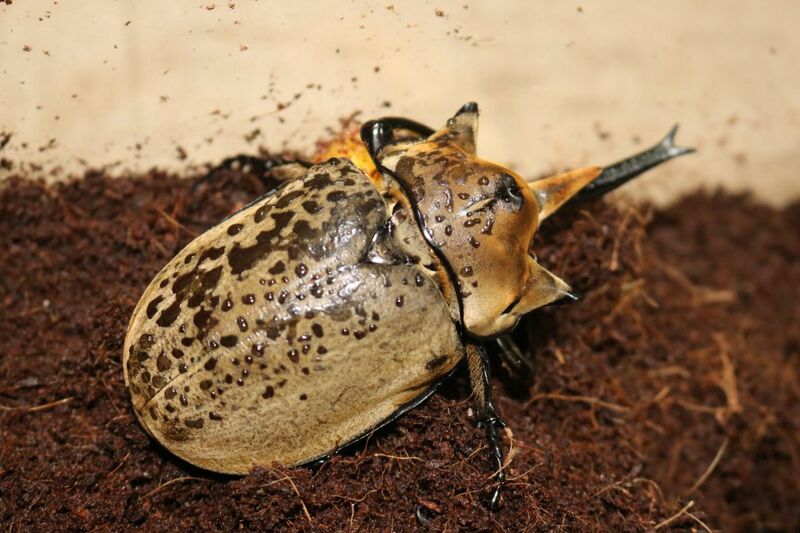 The Hercules beetle tends to be a fan-favorite at BugFest. In Verderame's book, insects also suffer from a familiar modern-day problem: alarmist media coverage. "The only time you ever hear of these creatures is if it's biting, or stinging, or a new disease is discovered with mosquitoes. You never really hear the good in the news." Bees, for example, tend to conjure mental pictures of swollen red stings. But they are also responsible for most of the food we eat. Attendees will get a sense of the full story at BugFest and can also participate in a number of insect-theme activities designed to increase our comfort with the critters that live around us. Alongside the live bug displays, visitors can watch cockroaches race in a three-track rink, take home artwork made by maggots, and go on bug walks around the Parkway with academy entomologists to learn about Philadelphia's local insect life. A bug-friendly chef will cook up a selection of dishes for guests to sample, including "chocolate chirp" cookies, which have "a lot of protein," according to Verderame. “Chocolate chirp” cookies will be served at BugFest.